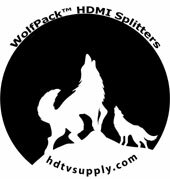 HDTV Supplys WolfPack 1X8 HDMI to CAT5 Splitter allows you to send both an HDMI audio and an HDMI video signal from one end of a room to the other or one floor to another with standard, inexpensive and reliable CAT5e or CAT6 cables and distribute out to different rooms. See the above 1X8 HDMI to CAT-5 Splitter front and back pictures. 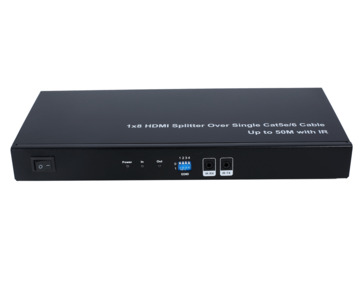 This WolfPack 1X8 HDMI to CAT5 Splitter is an HDMI splitter with eight RJ45 outputs. It distributes the input of the HDMI signal into the eight identical outputs simultaneously. Eight supplied HDMI Receivers by Cat5 receive the distributed signal from the splitter and transmit to displays individually. Also, the transmission distance is 125 feet even for a 1920x1200 resolution and also 125 feet for 5.1CH or 7.1CH audio. Straight cable runs with no electrical interference, bends, kinks, patch panels need to provided. Allows you to send 1 HDMI audio and video source device to 8 HDMI equipped devices. The picture will be the same on both HDTV′s. Supports HD resolutions up to 1080p at a range of ~125 feet. Easy to Use: Installs in seconds, no settings. Transmission distance can be up to 125 feet for 1080p using a CAT6 Cable. Supports DVI with a DVI to HDMI cable or adapter. Supports 165MHz/1.65Gbps per channel (4.95Gbps all channel) bandwidth. NOTE 1: The eight CAT-5 to HDMI receivers are included that install at the TV end. AC adapters come with them that must be plugged in to an AC outlet.